Online marketplaces are unique websites that connect both buyer and seller in one convenient place. Transactions, processed through a sales operator (you! ), allow vendors to sign up on your website, list their products, manage their accounts, and cater to customers all from your WordPress site. And, as the marketplace operator, you are responsible for things such as site users, registrations, payment systems, delivery of product, customer satisfaction, and so much more. If you are looking to start a website that mimics the likes of Amazon, Etsy, eBay, or even the WordPress favorite, ThemeForest, understand that you will need a hefty marketplace WordPress theme that can handle everything marketplace related. Since online marketplaces are more complex than traditional eCommerce websites, you will need to make sure your WordPress theme has the power and functionality to handle the activities that come with buying and selling products online. To start, you will need to make sure the theme is responsive, so it reaches all possible site visitors, even those on the go. Additionally, compatibility with reputable eCommerce plugins such as WooCommerce will make collecting payments much easier, as well as other tasks related to your users’ available merchandise. Moreover, a solid shopping cart, a blog to keep customers updated and boost your SEO, and front-end forms for registration will all play a large role in the success your online marketplace. 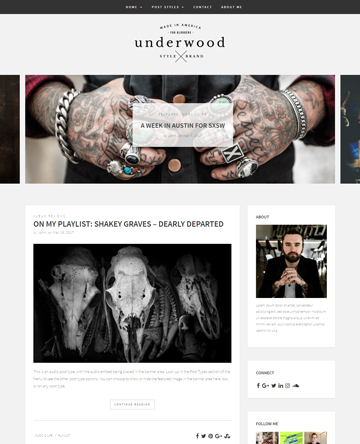 If you are in desperate need of a professional-looking marketplace WordPress theme, check out this roundup of the very best ones found on the market today. 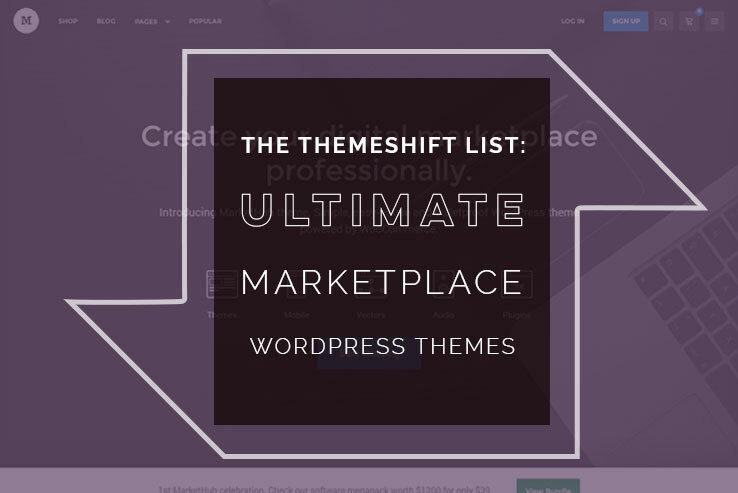 However, if you feel we have left out an important marketplace theme suitable for WordPress users, please feel free to share it with us. 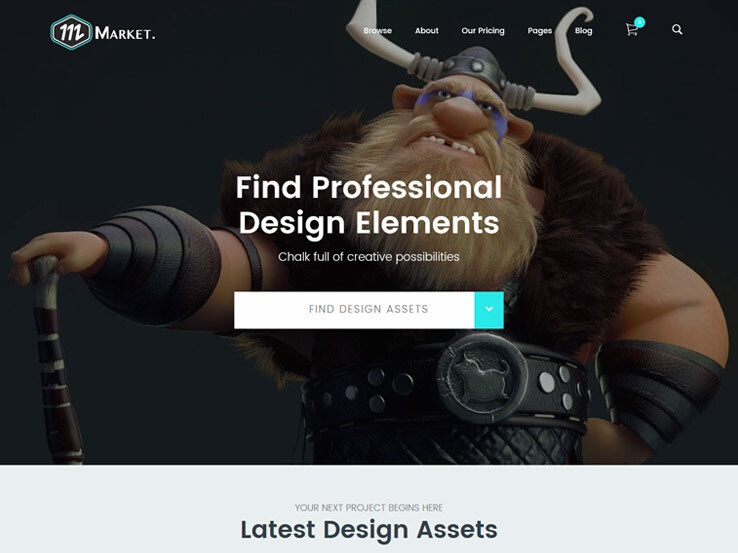 Designed for online marketplaces selling digital products, much like ThemeForest and Envato Elements, Market offers a stylish and professional web design that will attract both buyers and sellers alike. 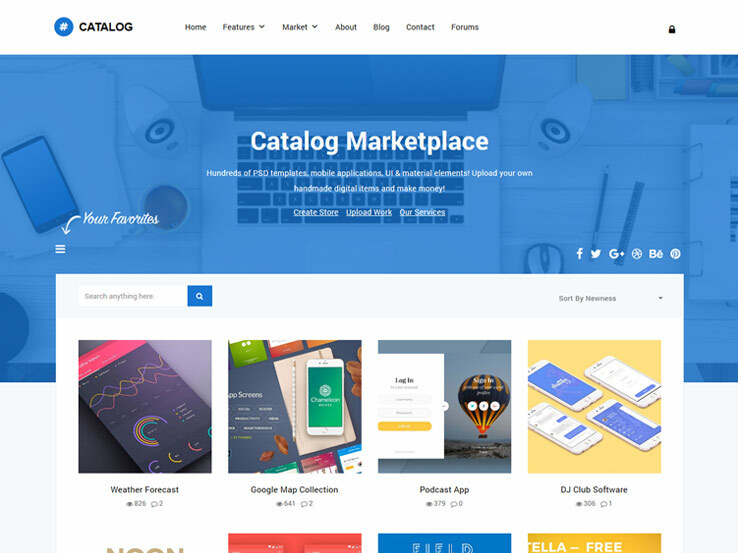 Compatible with the trustworthy WordPress plugin, Easy Digital Downloads, this marketplace theme allows the sale of digital products, front-end vendor submissions, easy site building thanks to the built-in page builder, and has clean, secure coding for a great SEO boost. And, if you use the premium Simple Shipping plugin you can also add physical products to your community sales website if you want. Additionally, Market comes translation-ready to reach a more global audience, has video post capability, includes a parallax builder for added visual appeal, and even has an exclusive icon set pre-packaged with your theme purchase. Lastly, Market is compatible with the EDD Marketplace Bundle so you can set your website apart by adding reviews, ratings, vendor commissions, points & rewards, and more. 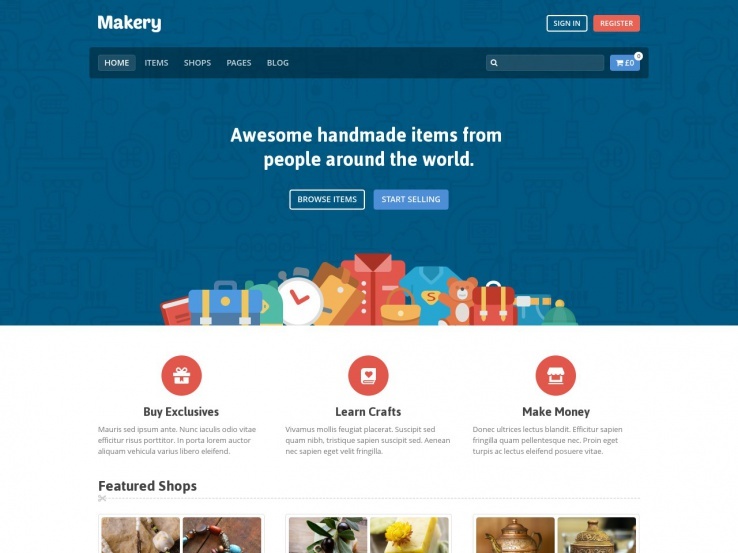 Makery is not just your average marketplace WordPress theme. Not only is it a theme, it is an application as well, with built-in features to make your community selling website the best. For example, it allows for unlimited shops, multiple carts, and shop commissions. In addition, it adds to the already packed WooCommerce functionality by extending your ability to add stores and products, complete orders, and track earnings. Changing the overall design of your website is easy using Makery’s intuitive theme options panel. Change colors, fonts, backgrounds, and create sidebars. More so, include front-end Facebook login integration, translate your content, set up email notifications, and edit all of the default WordPress profiles to include information like pictures, product favorites, and contact information without even touching your site’s back-end. In the end, this marketplace theme turned application exceeds many templates designed for the same purpose. Coded with Bootstrap, HTML5, CSS, and jQuery, this buy/sell marketplace theme works well for even the busiest of multi-vendor websites. 100% responsive on all mobile devices, Catalog displays the clearest images, works on all major browsers, and has an easy-to-use theme options panel for changing every element on your site. For instance, feature a specific author to highlight a newcomer or a superior seller, create custom commissions, set featured items, or let your vendors make changes on the front-end without accessing the back-end. Catalog also comes compatible with bbPress for creating a discussion forum. Questions will be answered and sales will be made from getting everyone engaged with each other and the available online shops. 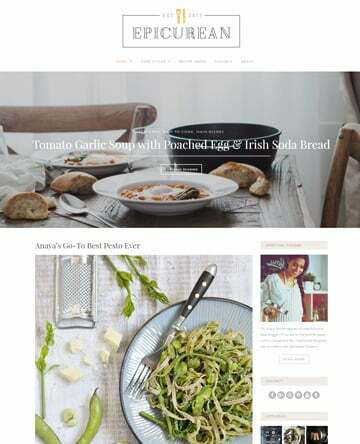 More so, this WooCommerce compatible theme offers MegaMenu support for easier site navigation, unlimited color options for branding your site, and has over 50 shortcodes for added functionality. In all, this multi-vendor theme has everything you need to get your sellers selling and buyers buying. 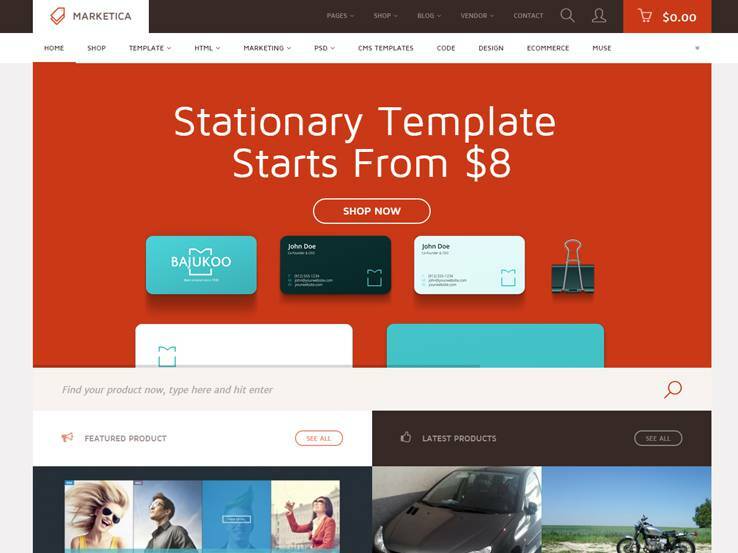 Claiming to be the number one marketplace theme for WordPress, Marketica turns your website into a multi-vendor website in minutes. For instance, use the included premium Visual Composer plugin to build your website in organized sections. Then, add a stunning slider using Slider Revolution, translate content with WPML, and craft multiple post types such as image, gallery, quote, status, or video. With this theme, both you and your vendors have control over product listings. Plus, if you have products of your own you want to sell, you can do that too via your typical shop pages. And what’s more, in order to build a strong brand recognition amongst your loyal site visitors, you can create a custom favicon, header, and background, grabbing everyone’s attention from the start. Altogether. this highly advanced marketplace theme will work well for any business looking to build a multi-vendor eCommerce website. 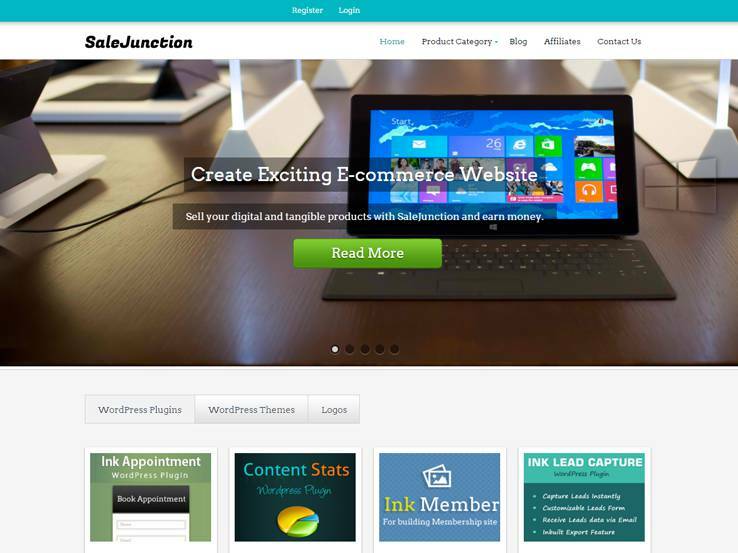 MarketHub concentrates on providing the perfect digital marketplace for WordPress website owners. Using both WooCommerce and WC Vendors plugins, this community selling theme gives you an easy way to get started without knowing any code or having a lot of technical knowledge. For example, create a sidebar navigation section, allow buyers to start a wishlist for future purchases, craft a “Popular Products” page and highlight bestselling items, and even draft a testimonials section so users can share their personal experiences. In addition, MarketHub comes fully responsive, has login and registration page templates, and an advanced Reviews section. Creating a niche-specific marketplace? MarketHub also has digital shop specialization implementing niche specific functionality like page templates and shortcodes. 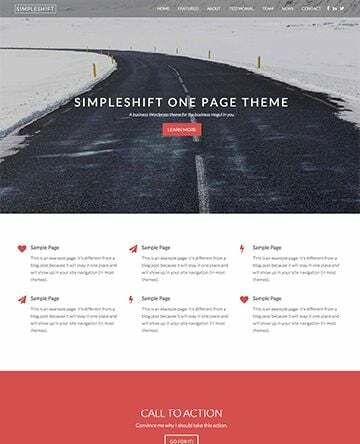 In all, this relatively simple marketplace WordPress theme has what it takes to get your visitors buying and selling in no time. If selling physical and digital items on a marketplace website is what you want to achieve, SaleJunction may be just right for you. Working with both WooCommerce and Easy Digital Downloads, you can easily create and add products to your website for immediate sale and present them in a clean and organized way. Additionally, choose from 7 color schemes, add social icons in the footer, display your blog’s latest posts, and even include a business tagline so site visitors know what you are all about. SaleJunction impresses both potential sellers and buyers from the start with its full-width moving slider while showing off five prominent images. More so, you can easily guide customers through the checkout process and rest assured SaleJunction has a secure payment gateway – PayPal – in place. In addition, take advantage of the available premade page templates for creating things like contact, login, and blog pages. 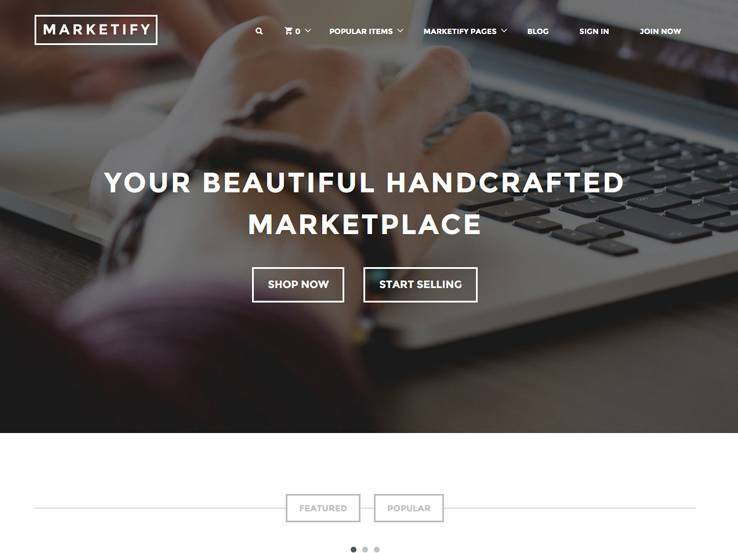 In the end, this responsive marketplace theme provides you an excellent way to build a strong community-based selling website with multiple vendors, including yourself. Turning your WordPress website into a full-blown marketplace doesn’t have to be complicated. Using Walleto, you can start selling both physical and digital goods and use any of the traditional online payment gateways – PayPal, Authorize.net, and Google Wallet, to name a few. In addition, Walleto lets you host your own blog so you can boost your SERPs and keep your audience informed. And, to boost user engagement, and hopefully sales, there is a private message feature that customers and sellers can utilize to discuss any questions or concerns they have. With this theme, each seller has access to their very own store with a user account to track orders, update products, add images, and manage everything else related to their sales. 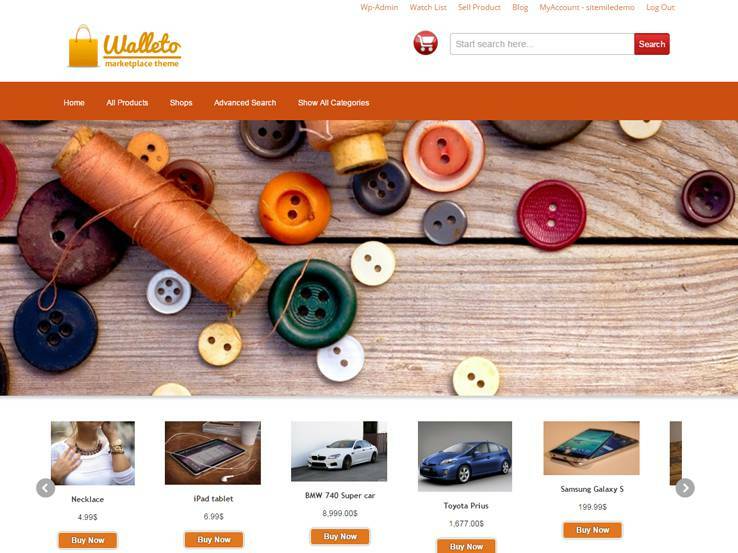 However, know that Walleto gives website owners complete control in the admin section for changing all things store related – images, customer details, posted products, shop details, and more – while also being able to customize the overall appearance of the website in terms of color, font, and layout. 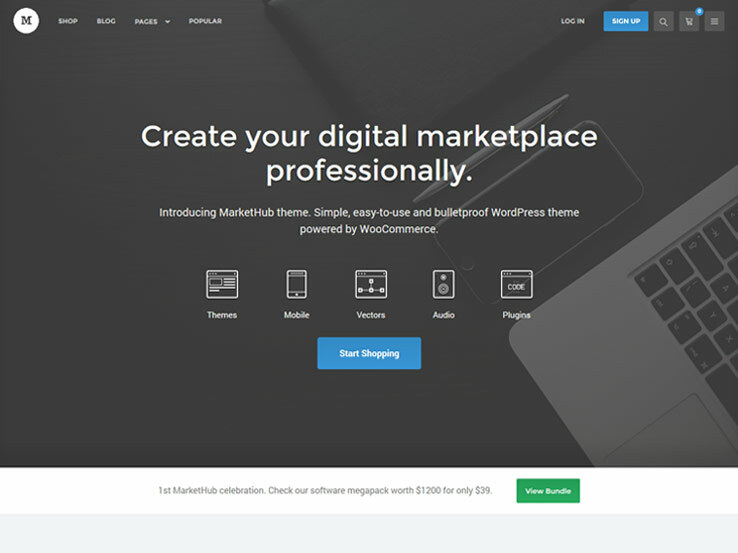 Altogether, this theme has loads of great features for getting your marketplace up and running. Focusing on its ability to render correctly on all screen sizes and devices, Marketify has revamped its responsive design to make it even better than before. Of course, this is in addition to continually tweaking the theme’s overall feature set to be the best it can be. Start by choosing from tons of pre-designed page templates and begin building pages and designing elements using the included theme widgets. Next, take advantage of front-end submissions, recommend the best products, let visitors build wishlists, and implement a review system on your website by integrating the popular Easy Digital Downloads plugin. Additionally, you can easily split profits garnered through sales with your vendors based on a certain commission percentage. Plus, you can add a store credit and deposit system to encourage later purchases. Lastly, Marketify offers you a great way to appeal to visitors using audio and video product previews. 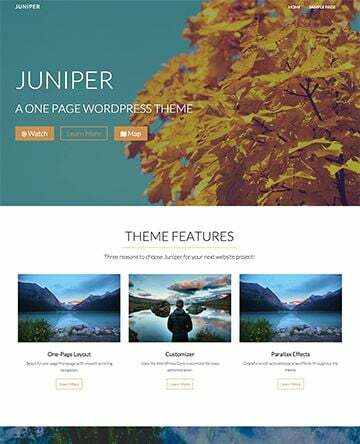 In the end, you will not be disappointed if you choose to go with this WordPress marketplace theme.